This replaces the metal emblems on the D Trucks. 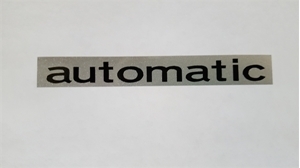 Is your "automatic" decal missing or pitted? This is a vinyl decal made to look like the original emblems. It is made with metallic silver vinyl and gloss black lettering. Comes as a set.